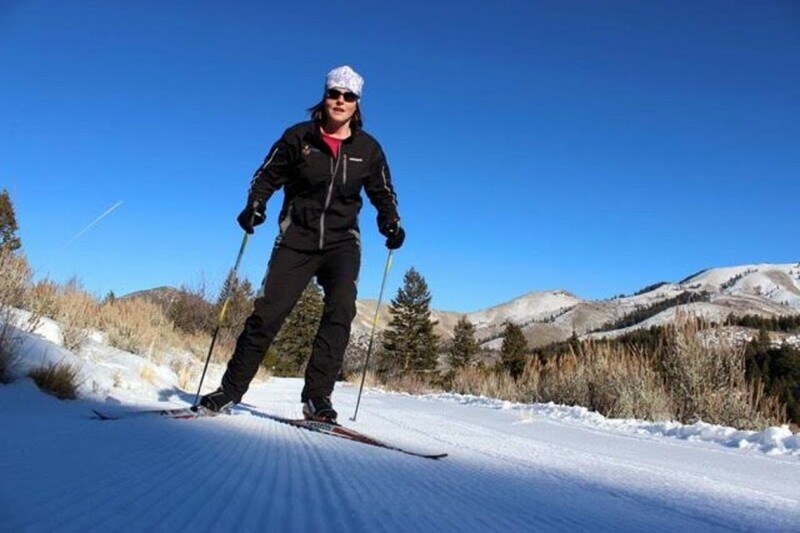 IDAHO’S LONG SNOW SEASON and high elevation sets the stage for hundreds of miles of cross-country skiing and snowshoeing. Along with these 300-some miles of groomed ski trails, there are over 100 soakable hot springs in the Gem State as well. Below you’ll find three of the best soaks in Idaho to pair with your next cross-country skiing or snowshoeing adventure. 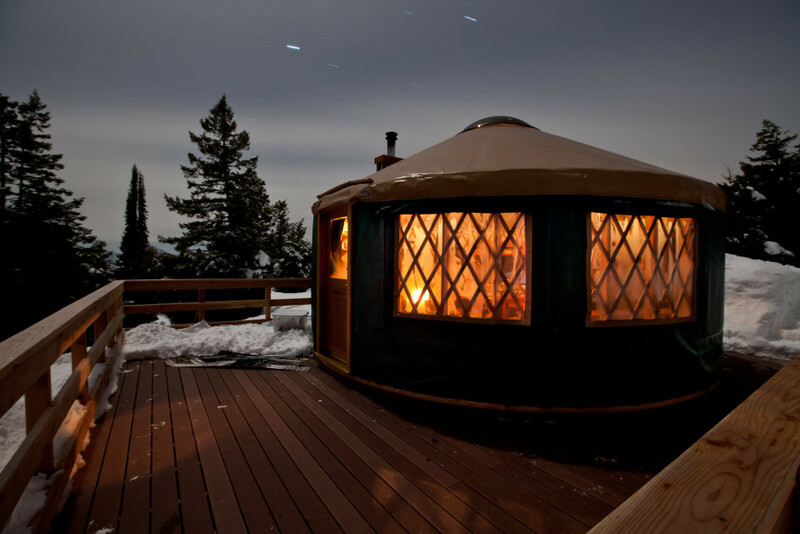 Located deep within the mountainous confines of Boise National Forest, the Idaho City Yurts have been strategically placed on top of forested ridges and bluffs, providing skiers prime views of the territory along with complete seclusion. During winter, they can only be reached via a 3-mile cross-country ski or snowshoe trek. Hundreds of miles of ski and snowshoe trails are accessible from the yurts, trailhead parking lot, and other nearby Idaho Park N’ Ski lots. Each yurt is furnished with a wood-burning fireplace and all the kitchen essentials, comfortably sleeping six for $85-$100/night. Find it: From Boise, take Highway 21 north for 63 miles to the Whoop-Em-Up parking lot and yurt trailhead. Restrictions: Check yurt availability. Idaho Park N’ Ski permits ($7.50) are good for three days and can be printed online. The Springs happens to be Idaho’s only LEED-certified commercial hot springs, designed with sustainability in mind and constructed with local resources. 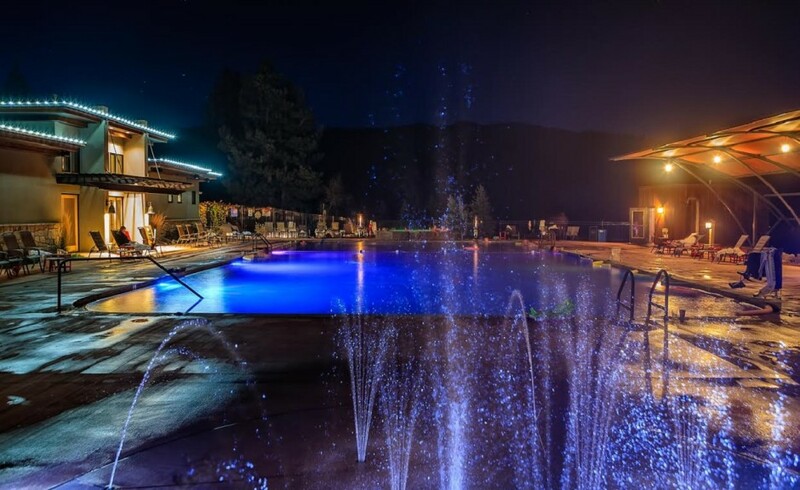 Hot geothermal showers, free organic coffee and tea, soft towels, and immaculate facilities complement the 40×80-foot pool and 16-foot hot tub. With a pH of 9.6, the water at The Springs is heavy on the alkaline side and is Idaho’s softest. Well-positioned for both pre- and post-adventure, The Springs is 20 miles from the Idaho City Yurts trailhead parking lot. The complex was renovated in 2013 but has a long and varied history — it was formerly known as Warm Springs Resort, but has also operated as a post office, police station, saloon, and stagecoach stop. Find it: From Boise, take Highway 21 north towards Idaho City. Before you hit town, look for the signed turnoff past mile marker 37. Sitting on a peninsula in Payette Lake just outside the city of McCall, the 1,500+ acre Ponderosa State Park has over 10 miles of groomed Nordic trails and 3+ miles of maintained snowshoe trails. There are also a handful of rustic overnight cabins for wintertime visitors set along the lakeshore, all of which come fully furnished (kitchen included) and sleep groups of up to eight. The cabins range from $75-$150/night, not including reservation and cleaning fees. Find it: From Boise, take Highway 55 north over 100 miles to McCall and follow the signs leading to the park. Gold Fork Hot Springs is south of Ponderosa State Park, near Donnelly, and is a logical stop after a day of crushing powder among the pines. Gold Fork isn’t as fancy as The Springs, but there are six different pools to try (compared to The Springs’ two), all far away from any highway noise, giving it a peaceful, secluded feel. Great effort has been made to keep Gold Fork as natural and low impact as possible. While this means fewer amenities, it also equals more face time for you with Mother Nature. Gold Fork’s mineral water is heavy on the alkaline side with a pH slightly over 9; the water also contains lithium and other minerals credited with soothing body, mind, and soul. Find it: From Boise, take Highway 55 north past Cascade to a well-signed road near milepost 128 heading east. Follow the signs to the hot springs. Twenty miles of wide, snowy, well-groomed cross-country trails, separate snowshoe trails, a sledding hill, and a Mongolian snow hut spell a great day for winter adventure seekers at Mink Creek, a few miles south of Pocatello. There are also 250 miles of groomed snowmobiling trails that weave in and out of the mountains and valleys of Caribou-Targhee National Forest, and warming centers are conveniently located for both snowmobilers and skiers. Find it: From Pocatello, take Main Street south until it becomes Bannock Highway. After 4.5 miles, veer right as the road changes names again to Mink Creek, and then watch for the left turn onto East Fork Mink Creek Road for the remaining 1.6 miles to the Nordic Center. Restrictions: Trail passes ($8/adult) and parking passes ($5/car) can be purchased at the Nordic Center. Trail passes aren’t required for snowshoeing. East Mink Creek is a 30-minute drive from the natural hot pools at Lava Hot Springs. 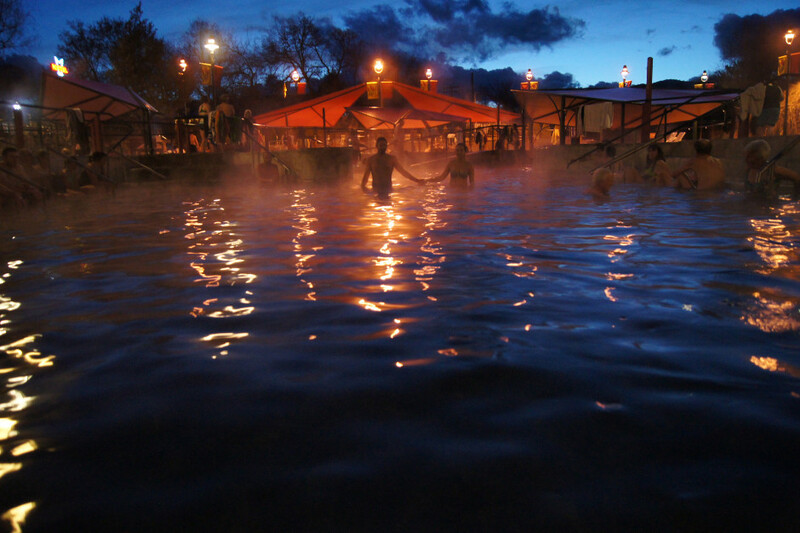 Located in the Portneuf River Valley along the old Oregon and California Trails, Lava Hot Springs is Idaho’s largest commercial hot springs establishment. This site is especially popular due to its four outdoor, sulfur-free pools (no rotten egg smell) with temperatures ranging between 102 and 112 degrees Fahrenheit and featuring gravel bottoms with cement walls. The facility includes on-site massage therapy, and for those making a trip, there are plenty of overnight lodging and food options nearby. Find it: South of Pocatello, take exit 47 off of I-15 to US-30 East for 11.2 miles to 430 East Main Street.